Tonya Harding started skating training at four years of age. Six months later she won her first competition. At twenty years old she became the first American woman to land a triple axel in competition—at the 1991 Nationals in Minnesota. In 1992, she placed fourth at the World Championship. With no sponsors to go on and no formal education, she got a job as a waitress until her former trainer came to re-engage her in training for an Olympics that would take place in 2 years-time instead of the customary four. She trained hard, got in top form and made the Olympic team in a controversial turn, for her skating rival, Nancy Kerrigan, was attacked by people hired (indirectly) by Tonya’s husband—one of the worst scandals of the sport world. I, Tonya is her chance to tell her story, her way. 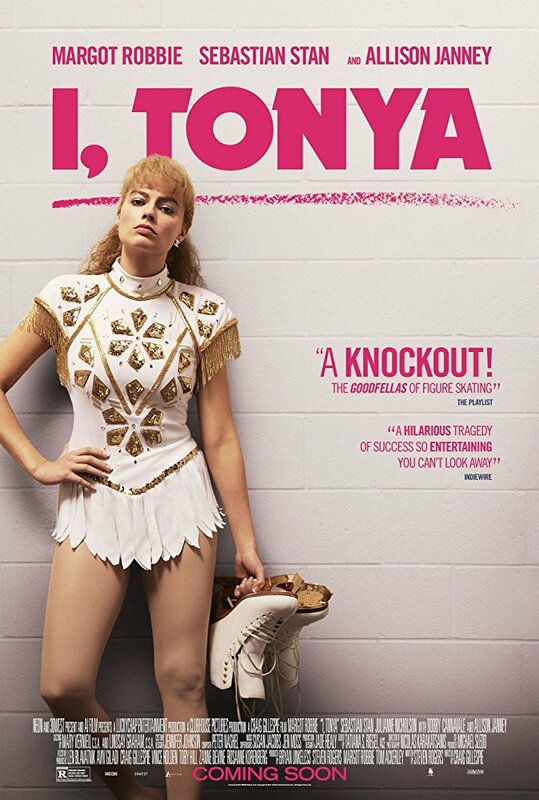 Written by Steven Rogers, directed by Craig Gillespie, with a running time of 120 minutes, starring Margot Robbie (Tonya Harding), Allison Janney (LaVona Harding), Sebastian Stan (Jeff Gillooly), Bobby Cannavale (Martin Maddox), and Julianne Nicholson (Diane), based on true events, I, Tonya is a gritty, dark comedic look at the not so charming life of Tonya Harding. 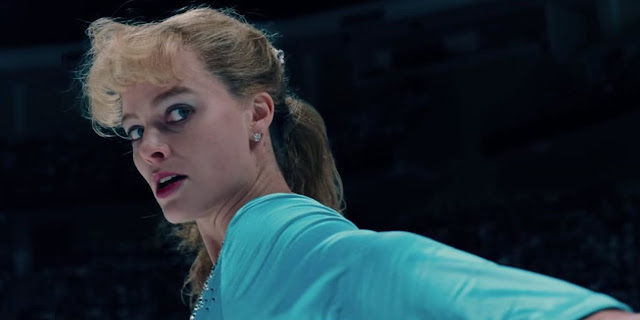 As with The Greatest Showman, I had a conflicted first viewing experience of I, Tonya. I thought that it reflected too much physical and emotional abuse to be “funny”, even darkly so. I understood the life experiences Harding had gone through that made her resilient yet defiant, and I realized that the film had managed, in the end, to portrait her in a more favorable light, not as the villain she has gone down in history for, the attack on Nancy Kerrigan during the qualifiers for the 1994 Skating Olympics. Move forward to my second viewing. This second time I was less chocked by the physical abuse on screen, the shock value likely decreasing because I knew what to expect. Still, I, Tonya is very gritty for a drama. It is funny too, darkly so, idiotically so... the movie, as the real events, populated by shady characters planning and executing an act that has more to do with a mob hit than an elite sport competition at any level. I, Tonya unfolds in the form of mock interviews, with key players narrating events the same way the original interviews occurred during the legal investigation. The actors even physically resemble the actual players, an outstanding job from the casting department. Allison Janney (of West Wing fame), as LaVona Harding (Tonya’s mother), was fierce, made no apologies and no concessions, her philosophy being that she did everything in her power to see Tonya succeed. Janney did such an outstanding, disappearing-into-the-character type of role that she swept with the awards in all the Award shows from the 2017 season. She got the Oscar for Best Supporting Actress to crown her efforts, though I wasn’t as taken with her performance as most critics and her peers were, probably because I wasn’t that crazy about the movie to start with. In my opinion, she had a strong, match-to-the-death competitor in Laurie Metcalfe for her role of Marion, another fierce mother, in Lady Bird. Sebastian Stan, the famous Sergeant Bucky Barnes of the Marvel Cinematic Universe, makes a perfect villain with a pretty face, and in I, Tonya, as Jeff Gillooly (Tonya’s first love and husband), he does not disappoint. He is charmingly manipulative, impulsive, a physical abuser, and makes plenty of apologies for not knowing the nature of the plan that was going to be carried out, and also for having ruined Tonya’s career. He should have apologized for having such an idiotic friend too. As Janney, he disappears into his role. Unfortunately, it is ultimately his female costars the movie belongs to. Last but not least, is Margot Robbie in a career defining role as Tonya Harding. She was brash, fierce, very rough on the edges, and made no apologies about her difficult upbringing or the difficult choices she made. All that comes gloriously across on screen to the advantage of the real Tonya Harding. Robbie, with the help of a good screenplay, portrayed Tonya as a resilient, poor redneck and proud of it. Margot Robbie was nominated to the Academy Awards in the Best Actress category for this role, and it was very well deserved. She has increasingly taken more demanding roles in the last few years in movies such as Z for Zachariah, The Wolf of Wall Street, a memorable cameo in The Big Short, Goodbye Christopher Robin (See Snapshots - #34), and Suicide Squad. Not bad for a career that is just beginning. I was almost afraid to watch this movie. I thought it would be crass and cheap and too gritty for me. Finally I did watch it and I was awed by how well the movie portrayed the whole convoluted story, how it straddled the blurry moral line the whole way through but made no overt judgements. Mostly I was awed by Tonya as a character and Margot as an actor. Later I had to think that if a white male athlete had done (heck probably has) such things he probably would have gotten away with it. So, great review but I didn't get if you actually liked it more after the second watching or not. Great analysis, Judy! Yes, I did like it more on second viewing, probably because I had already been shocked once and knew what to expect. I remember very well the defining moment of Tonya (and Nancy Kerrigan's) public life. It was such a shocking but ultimately, as you say, darkly comic happening. I hope both women have found peace in their lives after all that notoriety. There was plenty of material there for a movie. There was plenty of material for a movie, like you say, and the filmmakers handled the material quite well. Not a film that was particularly on my radar but your review has me intrigued now so thanks. Glad to help, Lynn. :-) I recommend you watch it. My husband & I didn't expect to like this movie at all and were pleasantly surprised by how much we did like it. I don't know how they toed the line in making the screenplay but it was well done & creative. It made Harding come off more sympathetically and the whole circus around what happened pretty crazy. It was quite darkly funny! but also managed to have some feeling about it too. Robbie did well.